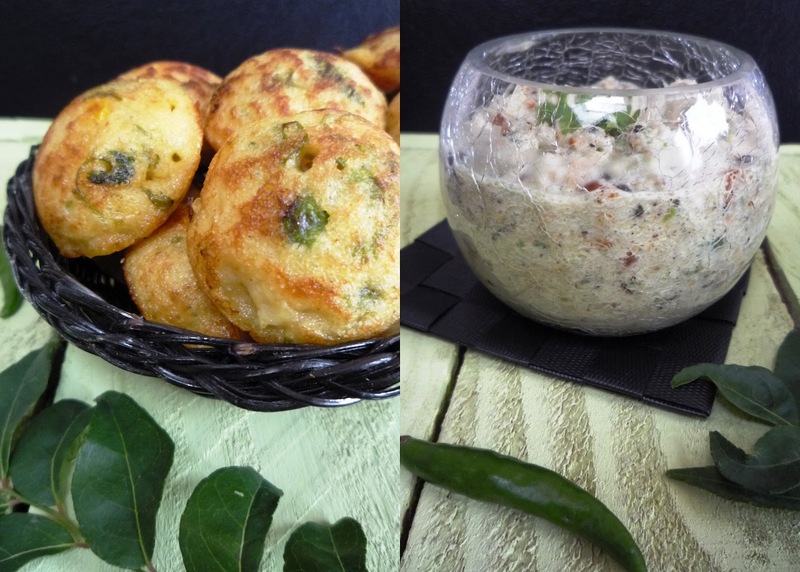 Jagruti's Cooking Odyssey: Vegetable Paniyaram for Blog Hop Wednesday !! Today's post is for event Blog Hop Wednesday brainchild of Radhika , author of the Tickling palates. "This venture is an attempt to broaden our culinary skills, get to know each other and try out new recipes and at the same time be connected with other bloggers meanwhile making ourselves into becoming the best cook. Throw in some interaction, suggestion, ideas with a new blogger it will be added fun giving us all a chance to visit others space and going through it fully." This week I am paired with Sangeetha Vijay of Spicy Treats. Her blog is full of full of spicy and tasty different recipes. Mostly I liked all of her South Indian delicacies, and I was so amazed when I saw nearly half a dozen different type of Paniyaram recipes..I only know two types :-) so instantly I decided that I will make one of the Paniyaram dishes, but it was very hard to choose! Which one to make? because for me all of them looked tasty and yummy. Then my daughter came to the rescue and we landed on Vegetable Paniyaram N Vegetable Oothappam . Heat oil in a pan and add Mustard seeds, both daals and curry leaves one by one. Fry for a while then add onion, ginger and green chillies. Add mixed vegetables and cook them for minute or so. Now add tomato and chilli powder and turmeric powder with salt. Mix well and cook with lid on. Cook till veggies are almost done , add fresh coriander and turm off the heat. 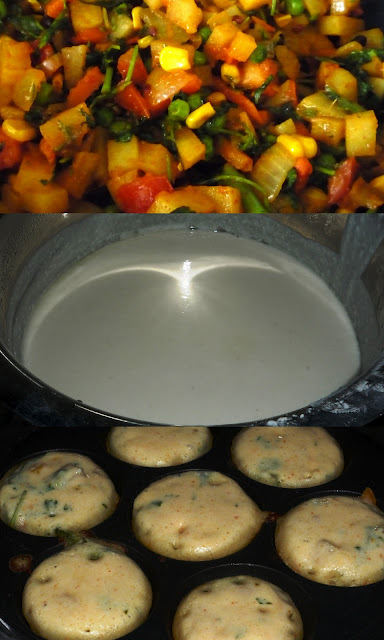 Add the cooked vegetables into the dosa batter and mix well. Check the seasoning. Heat the paniyaram pan and add few drops of any oil and pour a small amount of batter into each hole. When they starts to cook one side, turn them very carefully and cook other side till they are crispy and light brown on both sides. Remove from the pan and serve hot with coconut or tomato chutney. We had ours with Coconut chutney. Thank you Sangeetha for this delicious recipe, and I will make one by one all the paniyaram dishes in near future !! Linking it to event Shama's guest event Come and join our street party brainchild of Jagruti . its such a simple and delicious recipe. I dont mind having some rite now,yummy paniyarams. wow.. that's a very nice dish! A delicious recipe. And a truly irresistible combination of flavors. These paniyarams look so tempting...really delicious.Glad to have found your space through the blog hop. Your pics are too tempting..,lovely presentation dear!! Wonderful clicks Jags and I love that goblet very much. very cute it looks. Oh my!!! The paniyarams look so cute and perfectly done. Awesome job.